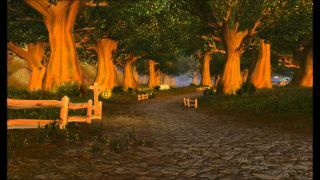 World of Warcraft has a unique visual style—colourful, chunky, but not what you'd call a 'looker'—that's dictated in part by the fact that the game is more than ten years old. But have you ever wondered what it would look like if it was made in, say, 2014 instead of 2004? Wonder no more, friend, because YouTube user Daniel Luchau has recreated the Elwynn Forest area using the Unreal Engine 4, and the results are impressive, as you can see. In the video, which was picked up on by Business Insider, Luchau says that this is still an early build, and he's working on a number of elements including proper LOD for trees and shadows for the entire scene, reflections, addressing pop-ins, improving wood textures, and reducing light intensity to help with both over and under-exposure. Beyond that, he hopes to complete the rest of zone, and in the "far future" would like to do Duskwood and Westfall as well, and release them all for VR platforms. When it comes to MMOs, I don't think visual fidelity is a make-or-break feature (the long-term success of World of Warcraft in its aged format is proof of that), but a little extra pretty doesn't hurt, either. Do you dream of exploring an Azeroth that looks like this?